Today was a fun bike ride versus a “tour”, but in the end we were rewarded with a special way to view one of the wonders of the world…from our bicycles. More severe clear skies, nice temperatures and no rain. Headwinds continue to haunt us along with some humidity that causes me to sweat profusely. All in all however we continue to be amazed by the string of perfect weather we’ve had. This group seems to have it down. Almost everyone made it, Marilyn, the tri-motor. Tucson Jan took a day off with seat issues. The box was loaded at 7am and the group then took a short ride to a breakfast buffet and then off for the day. Gerard and I got started about in the upper third of the group today. Early we pass Bob Frame who is riding solo and decides to join us. Shortly thereafter John Knapp in a spunky mood today (after riding all day yesterday with Marilyn) catches up with us and the four of us enjoy a nice pace and conversations for the first 35 miles to the first SAG stop. John’s ride with Marilyn sounded like a very nice experience for both him and Marilyn. Marilyn, age 65 school teacher did no training to speak of for the ride. She has ridden almost exclusively by herself. John seemed to enjoy the opportunity to get to know her better and keep her company. I am sure Marilyn enjoyed the company and the companionship. Yesterday John spent three extra hours on the bike as a result. That is a different type of challenge and experience. After the SAG Gerard and I continue with only Steve Bennett ahead of us. Steve has days when he hits it hard and days when he takes it pretty easy. Gerard and I are not sure what kind of day today is, but Steve seems to be in a hurry. About 20 miles to go we slowly catch up with Steve and the three of us ride into Niagara Falls together. As we cruise down the streets of the Canadian side, with no sign of the falls in sight, we are being “rained” on from the mist of the falls. It turns out we are three blocks away and the wind is blowing this tremendous mist to us. We are now “off route” exploring different vantage points to view the falls. The three of us ride up the river and find a route the takes us by huge parking lots where families and tourists of all kinds flock to see this wonder of the world. We eventually stop at a very nice Canadian restaurant and have a delightful (and expensive) lunch on a second story terrace with what seems to be “the” view of all three falls. From our perch with my digital camera I get some nice shots of fellow bikers viewing the falls as they roll in (unbeknownst to them). Eventually we get moving and check in to the hotel. One of our old basketball buddies and a law partner of Rich’s, Gordon Litt calls us to report that he is in Niagara falls with his family. Unfortunately our schedules didn’t mesh well and we couldn’t meet, but another example of the tiny world we live in. Above...Gerard and I after we cross the bridge back into the USA. At route rap we meet Marianne’s boy friend Barry who is coming with fresh legs to ride the last 7 days into Portsmouth. He seems like a great guy and a nice addition to the group. 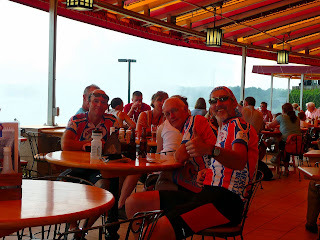 Today we loose a number of riders…Topper, Lois (who are biking back along Lake Erie to Detroit), Bud, Sarah and David. Tomorrow is Bob Frame’s last day. The ride is coming to an end and Rich and I are excited about finishing. We remind each other that we must stay focused, give it all of our attention all the time and not let our guard down. It is hard to believe that we have put in collectively roughly 230,000 man-miles with no serious injury or incident. Everyone wants to keep it that way to the end. Wish us luck and thank you for those of you out there praying for us, especially you Mom! Isn't this a nice picture? I can't believe how good my little Panasonic Lumix camera can be! The day ended in somewhat of a festive fashion. We had a long, but delightful dinner at Denny’s which exceeded most of our expectations. The food was great, the companionship and conversation delightful. Afterwards most of the group moved to the park overlooking the falls a short walk away and watched the light show and fireworks over the falls. Fun! I'm truly impressed with your pace! Look to the North for a quick trip to Niagra-On-The-Lake via the Parkway. Enjoy. Ralphie, the pictures are wonderful and I enjoy the music too. The falls look prettier than I have ever seen them.